When it comes to the controversial nominees President-elect Donald Trump has named for positions in his cabinet, Sen. Bernie Sanders, I-Vt., has pretty much made up his mind. “Before I vote against them, I want to hear what they have to say,” he told an audience at the George Washington University’s Jack Morton Auditorium Monday. Mr. Sanders said he has concerns about Jeff Sessions and Scott Pruitt in particular. Mr. Sanders has known Mr. Sessions, the nominee for attorney general, for several years as a member of the Senate. Mr. Sanders said he has strong concerns about the history of accusations that the nominee is racist. In 1986, a Senate committee denied Mr. Sessions a federal judgeship after former colleagues said he used racial slurs and joked about the KKK. Mr. Pruitt, nominated to be the administrator of the Environmental Protection Agency, has said he doubts the science linking human activity and climate change that is overwhelmingly supported by experts. Mr. Pruitt, who has close ties to the oil and natural gas industries, has sued the EPA during President Barack Obama’s administration. “It is kind of hard for me to imagine voting for somebody that does not believe that climate change is real and is not prepared to transform our energy system in order to protect the well-being of our grandchildren,” Mr. Sanders said. The senator said he wants to give the nominees a chance to make their cases but is not inclined to throw them a vote for confirmation. Mr. Sanders was at GW to participate in a live, prime-time town hall hosted by CNN’s Chris Cuomo. He took questions and discussed the Democrats’ strategy for the Trump administration. Mr. Trump is a pathological liar, Mr. Sanders said. This makes it difficult to believe him when he reverses or changes his positions. Mr. Cuomo said he had been told the media puts too much weight on what Mr. Trump says, missing what is in his heart, which prompted a laugh from Mr. Sanders. 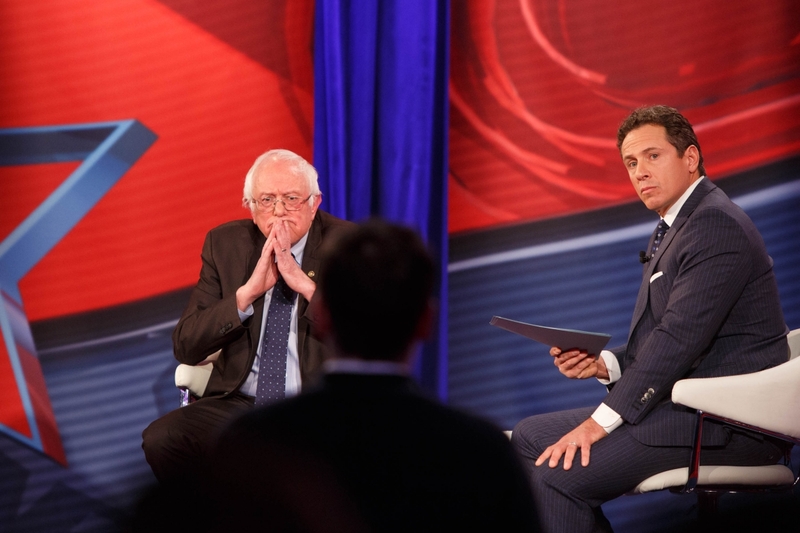 Sen. Bernie Sanders (left) and CNN's Chris Cuomo participate in a town hall meeting at GW on Monday. Sen. Sanders said he believes he can work with President-elect Donald Trump on trade issues. (Logan Werlinger/ GW Today). Democrats are channeling their energy before Inauguration Day into salvaging the ACA, coined Obamacare, which Republicans have vowed to repeal. Under the ACA, about 20 million Americans have been able to get health care who otherwise would not have, Mr. Sanders said. Democrats are planning rallies around the country on Saturday in support of saving the ACA. Republicans have promised to repeal and replace the health care law but have not announced any replacement plan. “I believe I speak for virtually every member of the Democratic Caucus that we’re going to do everything that we can to improve the Affordable Care Act. It has problems, but we damn well are not going to see it repealed and have no replacement there at all,” he said. Mr. Trump has said he doesn’t plan on reforming Social Security and Medicare, but House Speaker Paul Ryan has come up with a plan to privatize Medicare. “You might want to talk to Paul about that,” Mr. Sanders told Mr. Cuomo. Mr. Ryan, R-Wisc., is coming to GW on Thursday to participate in a CNN town hall with moderator Jake Tapper to discuss the House Republican’s “Better Way” agenda for the new administration. He also will take questions from the audience about the GOP’s strategy for President-elect Trump’s first 100 days in office. In 2016 Republicans acted “shamefully and outrageously,” Mr. Sanders said, by failing to consider President Obama’s Supreme Court nominee Merrick Garland. Now with a Republican in the White House, he said Democrats might adopt their obstructive tactics. Mr. Sanders said there are areas where he believes he can work with Mr. Trump, specifically to enact better trade policies. He will not, however, allow Mr. Trump’s xenophobic, sexist and bigoted statements go unchecked. Statements Mr. Trump made about immigrants, Muslims and women during his campaign troubled Mr. Sanders. The president-elect is turning people against one another, he said. Students, faculty and staff can request to attend events, which will feature questions from audience members. Sen. Sanders talked about working with the Trump administration while promoting his new memoir “Our Revolution: A Future to Believe In” at GW.